Ова е објавената верзија, проверена на 22 февруари 2019. Има 1 промена во исчекување на проверка. Стронциум е хемиски елемент со симбол Sr и атомски број 38. Земноалакален метал , стронциум е мек сребрено бел жолтеникав метален елемент кој е високо хемиски реактивен . Металот формира слој од темен оксид кога е изложен на воздух. Стронциумот има физички и хемиски својства слични на оние на неговите два вертикални соседи во периодниот систем, калциум и бариум. Се јавува природно главно во минералите целестин и стромонтит , и главно е миниран од овие. Додека природниот стронциум е стабилен, синтетичкиот 90 Sr изотоп е радиоактивен и е една од најопасните компоненти на нуклеарните последици , бидејќи стронциумот се апсорбира од телото на сличен начин како калциумот. Од друга страна, природниот стабилен стронциум не е опасен за здравјето. ↑ Colarusso, P.; Guo, B.; Zhang, K.-Q. ; Bernath, P.F.. High-Resolution Infrared Emission Spectrum of Strontium Monofluoride. „J. Molecular Spectroscopy“ том 175: 158. doi:10.1006/jmsp.1996.0019. Bibcode: 1996JMoSp.175..158C. http://bernath.uwaterloo.ca/media/149.pdf. 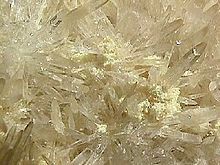 ↑ 3,0 3,1 "Mineral Resource of the Month: Strontium". U.S. Geological Survey. конс. 16 August 2015. Грешка во наводот: Неважечка ознака <ref>; називот „Greenwood112“ е зададен повеќепати со различна содржина. ↑ 5,0 5,1 5,2 5,3 5,4 C. R. Hammond The elements (pp. 4–35) in Lide, D. R., уред (2005). CRC Handbook of Chemistry and Physics (LXXXVI издание). Boca Raton (FL): CRC Press. ISBN 0-8493-0486-5. ↑ Ropp, Richard C. (31 December 2012). Encyclopedia of the Alkaline Earth Compounds. стр. 16. ISBN 978-0-444-59553-9. https://books.google.com/books?id=yZ786vEild0C&pg=PA16. Грешка во наводот: Неважечка ознака <ref>; називот „Greenwood111“ е зададен повеќепати со различна содржина. ↑ Miyoshi, N.; Kamiura, K.; Oka, H.; Kita, A.; Kuwata, R.; Ikehara, D.; Wada, M.. The Barbier-Type Alkylation of Aldehydes with Alkyl Halides in the Presence of Metallic Strontium. „Bulletin of the Chemical Society of Japan“ том 77 (2): 341. doi:10.1246/bcsj.77.341. ↑ Miyoshi, N.; Ikehara, D.; Kohno, T.; Matsui, A.; Wada, M.. The Chemistry of Alkylstrontium Halide Analogues: Barbier-type Alkylation of Imines with Alkyl Halides. „Chemistry Letters“ том 34 (6): 760. doi:10.1246/cl.2005.760. ↑ Miyoshi, N.; Matsuo, T.; Wada, M.. The Chemistry of Alkylstrontium Halide Analogues, Part 2: Barbier-Type Dialkylation of Esters with Alkyl Halides. „European Journal of Organic Chemistry“ том 2005 (20): 4253. doi:10.1002/ejoc.200500484. ↑ Halperin, Edward C.; Perez, Carlos A.; Brady, Luther W. (2008). Perez and Brady's principles and practice of radiation oncology. Lippincott Williams & Wilkins. стр. 1997–. ISBN 978-0-7817-6369-1. https://books.google.com/books?id=NyeE6-aKnSYC&pg=PA1997. посет. 19 јули 2011 г. ↑ Bauman, Glenn; Charette, Manya; Reid, Robert; Sathya, Jinka. Radiopharmaceuticals for the palliation of painful bone metastases – a systematic review. „Radiotherapy and Oncology“ том 75 (3): 258.E1–258.E13. doi:10.1016/j.radonc.2005.03.003. ↑ "Strontium | Radiation Protection | US EPA". EPA. 24 April 2012. конс. 18 June 2012. ↑ "Chernobyl: Assessment of Radiological and Health Impact, 2002 update; Chapter I – The site and accident sequence" (PDF). OECD-NEA. 2002. конс. 3 June 2015. ↑ Murray, W. H. (1977). The Companion Guide to the West Highlands of Scotland. London: Collins. ISBN 0-00-211135-7. ↑ Crawford, Adair (1790 г). On the medicinal properties of the muriated barytes. „Medical Communications“ том 2: 301–59. https://books.google.com/books?id=bHI_AAAAcAAJ&pg=P301. ↑ Sulzer, Friedrich Gabriel; Blumenbach, Johann Friedrich (1791 г). Über den Strontianit, ein Schottisches Foßil, das ebenfalls eine neue Grunderde zu enthalten scheint. „Bergmännisches Journal“: 433–36. https://books.google.com/books?id=gCY7AAAAcAAJ&pg=PA433. ↑ Although Thomas C. Hope had investigated strontium ores since 1791, his research was published in: Hope, Thomas Charles (1798 г). Account of a mineral from Strontian and of a particular species of earth which it contains. „Transactions of the Royal Society of Edinburgh“ том 4 (2): 3–39. doi:10.1017/S0080456800030726. https://books.google.com/books?id=5TEeAQAAMAAJ&pg=RA1-PA3. ↑ Murray, T. (1993 г). Elementary Scots: The Discovery of Strontium. „Scottish Medical Journal“ том 38 (6): 188–89. doi:10.1177/003693309303800611. PMID 8146640. ↑ Doyle, W.P. "Thomas Charles Hope, MD, FRSE, FRS (1766–1844)". The University of Edinburgh. Архивирано од изворникот на 2 June 2013. ↑ Hope, Thomas Charles (1794 г). Account of a mineral from Strontian and of a particular species of earth which it contains. „Transactions of the Royal Society of Edinburgh“ том 3 (2): 141–49. doi:10.1017/S0080456800020275. https://books.google.com/books?id=7StFAAAAcAAJ&pg=PA143. ↑ Davy, H. (1808 г). Electro-chemical researches on the decomposition of the earths; with observations on the metals obtained from the alkaline earths, and on the amalgam procured from ammonia. „Philosophical Transactions of the Royal Society of London“ том 98: 333–70. doi:10.1098/rstl.1808.0023. https://books.google.com/books?id=gpwEAAAAYAAJ&pg=102#v=onepage&q&f=false. ↑ Taylor, Stuart (19 June 2008). "Strontian gets set for anniversary". Lochaber News. Архивирано од изворникот на 13 January 2009. ↑ Weeks, Mary Elvira (1932 г). The discovery of the elements: X. The alkaline earth metals and magnesium and cadmium. „Journal of Chemical Education“ том 9 (6): 1046–57. doi:10.1021/ed009p1046. Bibcode: 1932JChEd...9.1046W. ↑ Partington, J. R. (1942 г). The early history of strontium. „Annals of Science“ том 5 (2): 157. doi:10.1080/00033794200201411. ↑ Partington, J. R. (1951 г). The early history of strontium. Part II. „Annals of Science“ том 7: 95. doi:10.1080/00033795100202211. ↑ Many other early investigators examined strontium ore, among them: (1) Martin Heinrich Klaproth, "Chemische Versuche über die Strontianerde" (Chemical experiments on strontian ore), Crell's Annalen (September 1793) no. ii, pp. 189–202 ; and "Nachtrag zu den Versuchen über die Strontianerde" (Addition to the Experiments on Strontian Ore), Crell's Annalen (February 1794) no. i, p. 99 ; also (2) Kirwan, Richard (1794 г). Experiments on a new earth found near Stronthian in Scotland. „The Transactions of the Royal Irish Academy“ том 5: 243–56. ↑ Fachgruppe Geschichte Der Chemie, Gesellschaft Deutscher Chemiker (2005). Metalle in der Elektrochemie. стр. 158–62. https://books.google.com/?id=xDkoAQAAIAAJ&q=dubrunfaut+strontium&dq=dubrunfaut+strontium. ↑ Heriot, T. H. P (2008). „strontium saccharate process“. Manufacture of Sugar from the Cane and Beet. ISBN 978-1-4437-2504-0. https://books.google.com/books?id=-vd_cn4K8NUC&pg=PA341. ↑ Börnchen, Martin. "Der Strontianitbergbau im Münsterland". Архивирано од изворникот на 11 December 2014. конс. 9 November 2010. ↑ Martin, Josèm; Ortega-Huertas, Miguel; Torres-Ruiz, Jose (1984 г). Genesis and evolution of strontium deposits of the granada basin (Southeastern Spain): Evidence of diagenetic replacement of a stromatolite belt. „Sedimentary Geology“ том 39 (3–4): 281. doi:10.1016/0037-0738(84)90055-1. Bibcode: 1984SedG...39..281M. ↑ "Chain Fission Yields". iaea.org. ↑ Nordin, B. E. (1968 г). Strontium Comes of Age. „British Medical Journal“ том 1 (5591): 566. doi:10.1136/bmj.1.5591.566. ↑ Turekian, K. K.; Wedepohl, K. H.. Distribution of the elements in some major units of the Earth's crust. „Geological Society of America Bulletin“ том 72 (2): 175–92. doi:10.1130/0016-7606(1961)72[175:DOTEIS]2.0.CO;2. Bibcode: 1961GSAB...72..175T. ↑ Ober, Joyce A. "Mineral Commodity Summaries 2010: Strontium" (PDF). United States Geological Survey. конс. 14 May 2010. ↑ Heuel-Fabianek, B. (2014 г). Partition Coefficients (Kd) for the Modelling of Transport Processes of Radionuclides in Groundwater (PDF). „Berichte des Forschungszentrums Jülich“ том 4375. ISSN 0944-2952. http://juser.fz-juelich.de/record/154001/files/FZJ-2014-03430.pdf. ↑ Stringfield, V. T. (1966). „Strontium“. Artesian water in Tertiary limestone in the southeastern States. Geological Survey Professional Paper. United States Government Printing Office. стр. 138–39. https://books.google.com/books?id=8eQqAQAAIAAJ&pg=PA138. ↑ Angino, Ernest E.; Billings, Gale K.; Andersen, Neil (1966 г). Observed variations in the strontium concentration of sea water. „Chemical Geology“ том 1: 145. doi:10.1016/0009-2541(66)90013-1. Bibcode: 1966ChGeo...1..145A. ↑ Sun, Y.; Sun, M.; Lee, T.; Nie, B. (2005 г). Influence of seawater Sr content on coral Sr/Ca and Sr thermometry. „Coral Reefs“ том 24: 23. doi:10.1007/s00338-004-0467-x. ↑ Kogel, Jessica Elzea; Trivedi, Nikhil C.; Barker, James M. (5 март 2006 г). Industrial Minerals & Rocks: Commodities, Markets, and Uses. ISBN 978-0-87335-233-8. https://books.google.com/books?id=zNicdkuulE4C&pg=PA928. ↑ 49,0 49,1 Ober, Joyce A. "Mineral Commodity Summaries 2015: Strontium" (PDF). United States Geological Survey. конс. 26 March 2016. ↑ Kemal, Mevlüt; Arslan, V.; Akar, A.; Canbazoglu, M. (1996). Production of SrCO3 by black ash process: Determination of reductive roasting parameters. стр. 401. ISBN 978-90-5410-829-0. https://books.google.com/books?id=5smDPzkw0wEC&pg=PA401. ↑ 51,0 51,1 MacMillan, J. Paul; Park, Jai Won; Gerstenberg, Rolf; Wagner, Heinz; Köhler, Karl and Wallbrecht, Peter (2002) "Strontium and Strontium Compounds" in Ullmann's Encyclopedia of Industrial Chemistry, Wiley-VCH, Weinheim. doi:10.1002/14356007.a25_321.